From the President For August! I can’t believe that it is August already, it seems like the racing season just got started and here we are looking at the five to go signal. It has been a relatively quiet season but in my travels I have noticed that both the fan and car counts pretty much everywhere have been down this year. There are a few exceptions to this and that is a very good thing as these tracks have struggled mightily for a number of years so to see things turn around for them is great. I have to admit that the club is struggling this year as well. Our treasury is exceptionally low and while we have gained some new members that number isn’t growing like it has in the past either. With this month’s newsletter we sent out the tickets for the annual cheer raffle. Each member or family membership received at least a book of ten tickets. It is vitally important that we get these tickets sold so that we can build up our treasury again in order to continue the things that we do. Our annual family picnic, Kid’s Christmas Party, off-season monthly meetings, newsletter and mailings all survive from the funds derived from memberships and this annual fund raising raffle as well as the MARFC Helmet Bag that we give away at each and every Fan Club Day. Yes, we get some donations but these are earmarked for the different events and while it is great to have folks give something back to the club, it just isn’t enough when the tally is added up at the end of the day. Ticket printing was once again sponsored by Pat Moran and Moran Chevrolet, they have been helping us out for many years and are an exceptional sponsor of local short track racing as well. If you are looking for a new Chevy or a quality used vehicle be sure to give them a call at 1-888-586-6726 they have dealerships in Fort Gratiot and Clinton Township and they can fulfill of your vehicular needs. Just got off of the phone with Auto City Owners/Promoters Joe DeWitte and Sharon Fischer and they have graciousely invited the club back out on September the 17th for our third attemt to hold MARFC Night at Auto City. This will be season championships as well as the hosting of the Turbo Blue Michigan Legends Series. It will be a big night of racing so come on out and support the Auto City Speedway on September 17th. Once again, Thank You to Joe and Sharon for all that they do and for their support of the Michigan Auto Racing Fan Club. July 30th was to be MARFC night at the I-96 Speedway but a 7 inch dumping of rain a few days prior to race day left the grounds of the speedway looking more like a lake than a racetrack. Even with extra help from neighboring racing facilities, Mike Mouch and the staff were forced to cancel the night’s events. This band of storms left the entire lower portion of the state inundated with flooding as well. Unfortunately, it doesn’t look like we will be able to re-schedule the night for this season but look forward to returning to I-96 in the 2012 racing season. The Prez. Made the trip to the west side of the state for another night of exceptional dirt track racing at Tom and Lois Sprague’s Winston Speedway this past July 29th. The SOD Sprints were on hand and they did not disappoint anybody in attendance. Wow is all I can say. Not only did the sprinters put on a great show but the modified division had a larger than normal field as Renegade Racing Fuels and club member Barry Marlowe had added additional sponsorship to the night’s events. 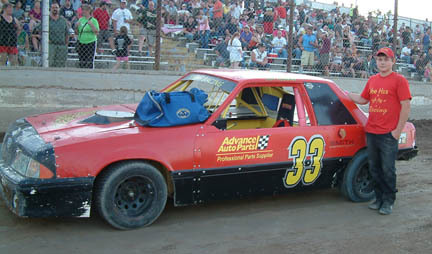 Cody Moorman, driver of the #33 four cylinder was the MARFC Helmet Bag recipient. Cody has been racing at Winston for five years and is looking to move up to a modified as his next step. Cody worked hard to gain positions this night but racing luck just kept him further back in the pack than he would have liked. It was a joy watching him work the traffic though and he has a bright future ahead of him. Mike Berck took a vacation to Silver Lake so he could take in the races and was our winner of the MARFC Member Raffle prize. Thanks again to The Sprague’s and the staff of the speedway for having us out to the Winston Speedway in Rothbury.